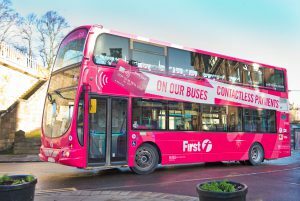 The introduction of Ticketer contactless ETMs is part of a £19.3m investment by First Bus aimed at improving the customer experience and to encourage customers to move from cash to digital transactions. It has been so successful that First Bus is now processing some 1.5 million contactless payments per month, with 33% of payments from its Aberdeen operating company already contactless. Mobile sales have also accelerated, and are now running at a rate of 1.5 million transactions per week. The Ticketer ETMs offer multiple payment options, from cash to mTickets with contactless flexibility offered through the payment service provider Littlepay. First Bus passengers can also now buy tickets on the First website, with a QR code sent to customers’ smart phones which are scanned as they board the bus.